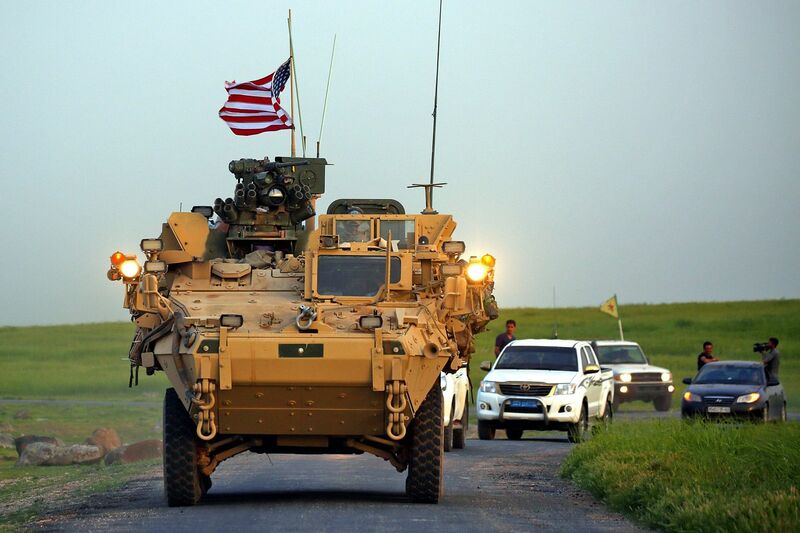 President Donald Trump's abrupt decision to pull all American troops out of Syria is yet another chilling reminder that those who believe in pledges and assurances made by the United States do so at their grave peril. While his generals and European allies may fret over the geopolitical implications of his capricious move, it is the US-backed Kurdish forces, fighting on America's behalf against the Islamic State in Iraq and Syria group in north-eastern Syria, who will bear the brunt of the repercussions. It is almost certain that Turkey, which has long labelled them as terrorists inciting its Kurdish minority to secede, will carry out its threat to move in and crush them. Deserted by the Americans who have been funding, training and arming them, the Kurds will pay for Mr Trump's perfidy with blood. He may have made good on his campaign promise to pull out US troops but, to the Kurds, he has just stabbed them in the back. And they say this openly, in so many words, to the world's media. South Korea, Japan and Taiwan must be watching this development - which is nothing short of a breach of faith - with great trepidation. So should other economies in the Asia-Pacific region which the US has been courting in its thinly-disguised attempt to contain the rise of China. Seoul and Tokyo, especially, could not have forgotten that soon after President Trump met North Korean leader Kim Jong Un in Singapore in June, he called off a long-scheduled military exercise between South Korean and US forces - just like that, without any prior notice to Seoul. Or that he has signalled more than once his aversion to keeping American troops in South Korea. No one can be sure now that he would not, in a moment of impetuosity, announce a US pullout from there as well, via Twitter at 3 o'clock in the morning. With America's reliability as an ally being brought into serious question, it is little wonder that Seoul and Tokyo will want to hedge their bets. Hence South Korea's quickened pace in reaching out to the North, and Tokyo's signals to Beijing that it is seeking a thaw in their frosty relations. Meanwhile, thinking Taiwanese are no doubt put on notice of the dangers that await them should they allow themselves to be used as pawns by the US in its bid for strategic dominance over China. How the Trump administration ditched its friends in Syria is a wake-up call like no other. How the Trump administration ditched its friends in Syria is a wake-up call like no other. Indeed, when it comes to honouring its promises and assurances, the US has a history it cannot be very proud of - from failing to return islands in the South China Sea seized by Japan from China, as agreed at the Cairo Conference in November 1943, to leaving Hungarians to their fate when Soviet troops moved in to crush their 1956 uprising which the Americans had encouraged. Vietnam, which Washington has wooed assiduously as a bulwark against Beijing's ambitions in the South China Sea, should also remember vividly how the US deserted its allies as the Indochina wars wound to a stop in 1975. No doubt many who have lived through those years will recall seeing television footage of the last US Marine helicopter evacuating Americans from the rooftop of their embassy in Saigon on April 29, 1975, amid pandemonium all around them. But a more poignant and shameful debacle had taken place in Phnom Penh three weeks before that. In early April, the US, having instigated General Lon Nol in March 1970 to oust Prince Norodom Sihanouk in a coup, decided five years later to abandon Cambodia to the Khmer Rouge forces closing in on the capital, a "bug-out" as then US Secretary of State Henry Kissinger called it. Then US Ambassador to Cambodia John Gunther Dean had earlier pleaded with his superiors in Washington not to do so but to no avail. He and all Americans were ordered to evacuate on April 12, which he later described as one of the most tragic days in his life, the day "the US abandoned Cambodia and handed it to the butchers". "We had accepted responsibility for Cambodia and then walked out without fulfilling our promise," he said in an interview in Paris years later. "That's the worst thing a country can do. And I cried because I knew what was going to happen." What happened was that after the Khmer Rouge took Phnom Penh, it drove two million of its inhabitants into the countryside at gunpoint. In the end, nearly all of them died from executions, starvation or torture. But a more stinging indictment of the US action came from Prince Sirik Matak, then Deputy Prime Minister of Cambodia. Ambassador Dean, out of honour and decency, had offered him a ride on the evacuating convoy and, thereafter, asylum. Prime Minister Lon Nol had already fled to Hawaii. Prince Sirik Matak replied in writing: "Dear Excellency and friend, I thank you very sincerely for your letter and for your offer to transport me towards freedom. I cannot, alas, leave in such a cowardly fashion. "As for you and in particular for your great country, I never believed for a moment that you would have this sentiment of abandoning a people which has chosen liberty. You have refused us your protection and we can do nothing about it. You leave us and it is my wish that you and your country will find happiness under the sky. "But mark it well that, if I shall die here on the spot and in my country that I love, it is too bad because we are all born and must die one day. I have only committed the mistake of believing in you, the Americans." This reply, reportedly circulated and read shamefacedly in the corridors of power in Washington, has gone into permanent record. Its author was later captured by Khmer Rouge soldiers and killed - some reports said he was shot in the stomach and left to die over three painful days, while another had it that he was beheaded. It is highly doubtful Mr Trump read the letter before he ordered the Syrian troop withdrawal. Or that he would care to. • Leslie Fong is a former editor of The Straits Times.